Have you ever really wanted to like a game, but there was that nagging something holding you back from fully endorsing it? Conceptually it’s amazing, but it has that one fatal flaw that brings it down? That’s the way I feel about Jotun. Jotun is a top-down action-exploration game based in Norse mythology. Thora, named for the week of thunderstorms at the time of her birth, just died an inglorious death at sea. Her mission is to navigate Viking purgatory, gathering runes so she can summon the jotun and face them in battle. If she is able to defeat each of these gigantic elementals, she’ll sufficiently prove herself to the gods and earn a place in Valhalla. Lore is sprinkled throughout Thora’s observations. If you think all of this sounds awesome, it’s because it is. The story is simplistic, but still enjoyable. I’m not very familiar with Norse mythology, but I’m sure those that are will appreciate the references. Through exploration, you discover God Shrines that offer God Powers you can utilize, such as summoning shields to surround you or creating a double to fool enemies. These shrines are to well-known Norse gods like Loki, Odin, and Frigg. Each level also has an Ithunn’s Apple you can find, which will increase your health, and a Mimir’s Well, where you can restore your health and refill your God Powers. Every area features hand-drawn artwork, and in many instances the camera will automatically zoom out so you can get a better glimpse of the scenery. I spent a lot of time taking screenshots of this game and all of its eye-catching backgrounds. The soundtrack is superb, composed with careful attention to detail. So much of Jotun is polished and well put-together, and I do like it for what it is. Each level has a different elemental theme, such as Nature, Storm, and Fire. However, there is one slight thing holding me back from loving it: an almost complete lack of guidance in the game. The opening cutscene plays, then you’re dropped right into Yggdrasil and have to figure out where to go from there. There’s no beginner level that’s meant to be a tutorial of sorts. 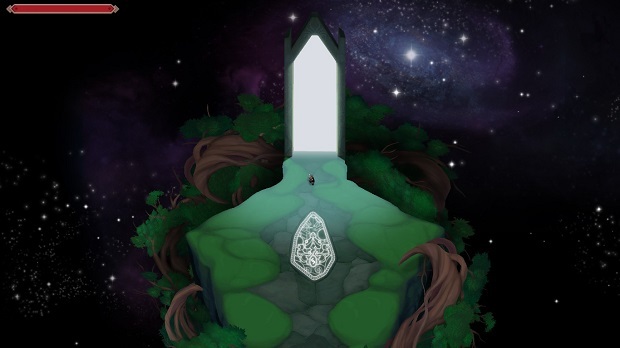 There are no signposts pointing the way, hovering instructions, or friendly NPCs sharing tips. The most you get is a map on the pause screen of each level, but it doesn’t have the ever-helpful “you are here” icon. Sometimes carvings in the ground will light up to hint which passageway you should go through, but once you clear the first area all the rest of them are unlocked automatically. Thus, even though they ramp up in difficulty, there is no natural progression displayed for you, so you could stumble upon something that’s way beyond your current capabilities. Most areas involve a lot of twists and turns to get anywhere. Now, I do understand that immersion is important. Maybe they didn’t want to distract from the art and the narrative with pop-ups explaining the game’s controls. I don’t believe they overlooked the issue of guidance entirely either, as the lights beneath your feet seem to suggest a subtle way to give the player direction. I also understand that this game is meant to be challenging. For instance, the boss fights are all extremely difficult, as each one has a lot of hit points, several different abilities, and the power to take out huge chunks of your health. Thora is a pretty strong, intimidating character until you put her beside Jera, the massive jotun that resides in the forest. Some other examples are that poison never naturally wears off, it only goes away with the antidote (which in this case is smelling blue flowers), and your God Powers don’t recharge over time, they can only be replenished at Mimir’s Well. See that little speck? That’s Thora. It just seems like an added layer of unnecessary frustration to expect the player to figure out everything on their own. What if they don’t venture to the farthest corners of levels and miss Ithunn’s Apples or God Powers, impairing them in later fights? What if they wander into an insanely hard area that doesn’t match Thora’s current strength, leaving them discouraged and annoyed? Trial and error can be expected when you’re battling a boss, but it seems a little unreasonable to throw the player to the wolves right from the start. I feel like there must be some way to integrate instructions into the game without them looking out of place. Don’t get me wrong, I have enjoyed what I’ve played. Jotun has a good balance of exploration, combat, dodging obstacles, and earning rewards. The aesthetics and sound design are excellent, and I’ve had fun swinging my axe around. It’s even immensely gratifying that the protagonist is female! A woman viking deserves an epic tale of adventure just as much as her male counterparts. This is an indie game that’s had a lot of hard work poured into it by a talented team of programmers, composers, animators, and artists. It was successfully funded on Kickstarter last year and was greenlit on Steam in less than a week, so you know it has plenty of appeal with a dedicated audience anticipating its release. I have faith that this crew cares a lot about their creation. Who knows, they could update the game later on and provide more clarity. Or maybe fans won’t care about the lack of hand-holding and it’ll be a non-issue. Whatever the case, the absence of linear action or even helpful hints is a concern in my eyes, and that’s what’s keeping me from giving it a higher rating. Jotun has most of the elements of a stellar game - good story, good artwork, good soundtrack, and challenges that feel rewarding when beaten - but it doesn’t offer players much guidance. It is deeply entrenched in Norse mythology, and the narrative seems to flow in a way that makes sense, but there isn’t a clear path directing you through it. Mythology fans that like a good challenge, including discovering everything through trial and error, will love this game.